Gillette's Best Disposable. 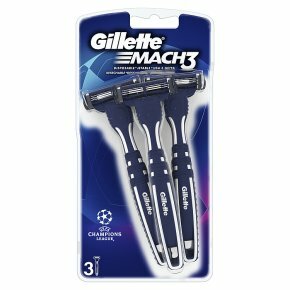 Gillette Mach3 Disposable Razors gives an incredibly close and comfortable shave with its 3 progressively aligned blades. Gillette?s best 3-bladed Disposable Razor. Three High-Definition blades for glide and comfort. Enhanced Lubrastrip helps blades glide over skin. Indicator Lubrastrip fades to white when shave is no longer optimal. Pivoting head provides incredible closeness. Ergonomic handle for great control with every shave.Gillette Mach3 Men?s Disposable Razor is Gillette?s best 3-bladed disposable razor. They feature 3 high definition blades for glide and comfort and an Indicator Lubrastrip, which fades to white to let you know when shave is no longer optimal. A Pivoting Heads provides incredible closeness. Complete with an Ergonomic handle for great control and maneuverability.